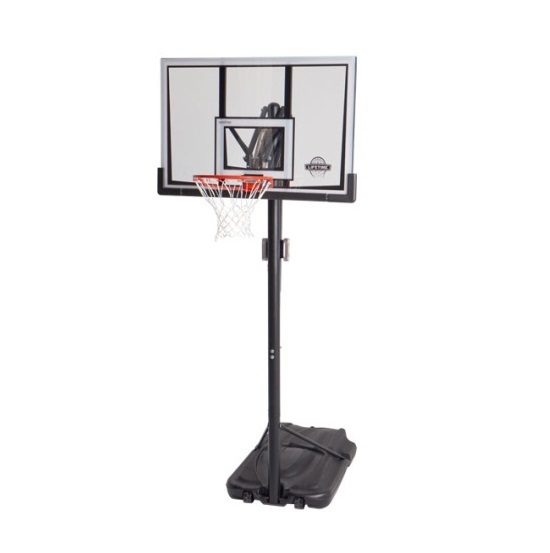 This Lifetime portable basketball goal provides an excellent option for families and basketball players to get their game on. 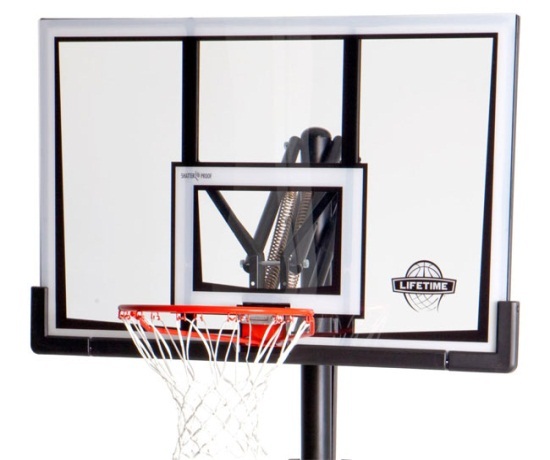 The 90061 has a large 52 inch polycarbonate backboard that provides plenty of space to develop your game, particularly your bank shot. Polycarbonate provides a better rebound than plastic is about 30 times stronger than comparably sized acrylic backboards. Best of all, this system features Lifetime's all new Front Adjust mechanism to raise and lower the system. 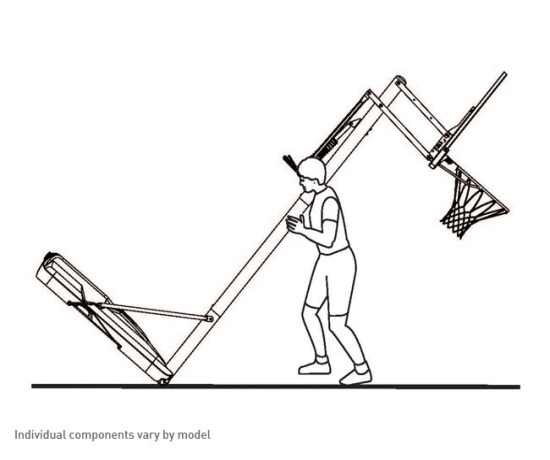 Simply grab the device with both hands, squeeze the triggers, and move the backboard up and down from 7.5 ft. to 10 ft. in 6 inch increments. 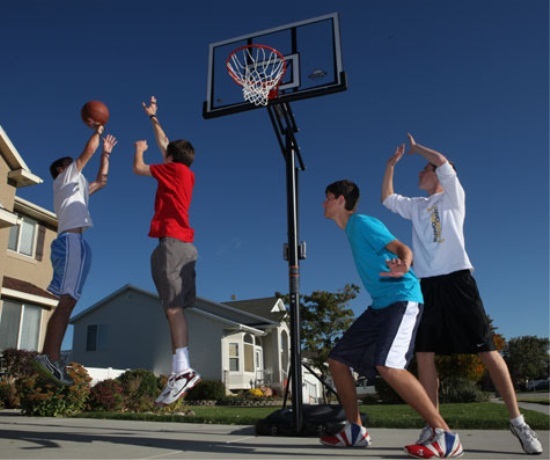 This basketball system utilizes Lifetime's all new Front Adjust lift mechanism. To use this new device, users no longer have to go behind the basketball system, but can simply go up to the front of the system, grab to the two triggers on either side of the pole and push up or pull down to adjust the height. 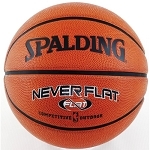 This new mechanism continues Lifetime's long history of innovation in the basketball hoop industry and provides a consumer-end first for allowing height adjustments from the front. Assembly of this system is required. Most times, assembly can be completed with just 2 or 3 adults. Lifetime Products runs a customer service line that can assist you with any assembly questions at 1-800-225-3865. Backboard frame: powder-coated steel frame. Backboard material: Shatter Guard Makrolon polycarbonate. Backboard material thickness: 3 mm (.1 inches). Polycarbonate backboards are about 30x strong than comparably-sized acrylic backboards. This spring loaded rim holds up well to aggressive play. Uses the Front Adjust height adjuster. 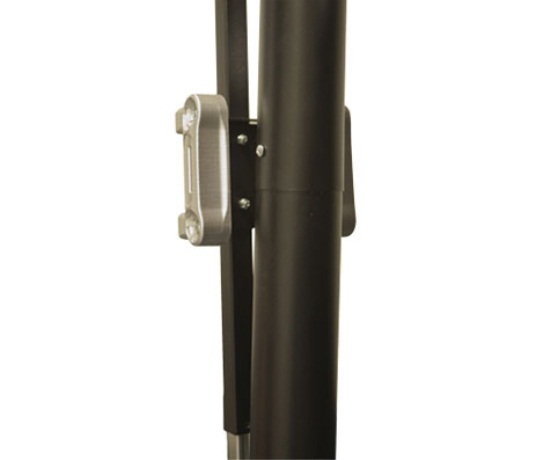 Front Adjust height adjuster uses a handle mounted on the pole and counter balance springs to raise and lower the backboard height. The height adjuster is activated by gripping both sides of the device and squeezing the triggers. The mechanism will then slide up and down. Weight of the base when filled with water: about 280 lbs. Typically, filling the base with sand makes the base weigh about 1.5 times more than filling the base with water. This weight factor will change depending on the density of your sand choice. Shipping dimensions: 52.5 inches x 34 inches x 10.4 inches. Assembled weight: about 103 lbs. My 14 year old son loves this goal,thanks for a good price.! Q: What is the difference between a plastic backboard frame and a steel backboard frame? A: Plastic frames are not as stiff as steel frames. 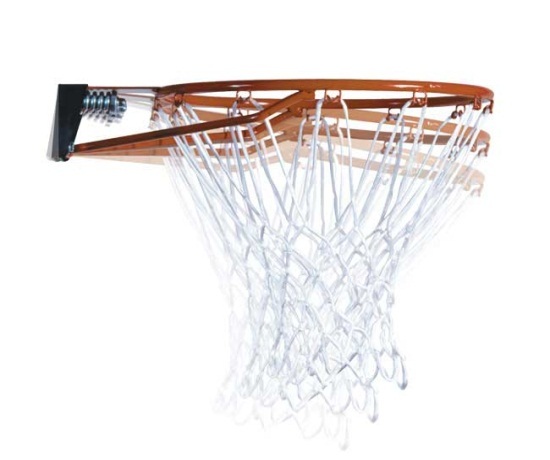 Thus, a backboard with a steel frame will produce a much better rebound than if the backboard frame is plastic. Q: Can my child operate the Front Adjust height adjuster? A: The Front Adjust is operated using a single handle mounted to the pole. The handle is somewhat high off the ground, making tampering with height difficult for particularly young children and manageable for older children. The mechanism requires two hands to use. This portable basketball hoop ships via FedEx for a doorstep delivery. No signature required. Fast Shipping! Orders generally leave the warehouse within 1 business day. Dimensions: 53" x 38" x 15"